The active and passive safety of the car has made great strides in recent decades, greatly reducing the risk that the occupants from being injured or being a victim of a car accident. The cars have become so smart to recognize a dangerous situation and intervene just before impact. But why no car is able to free the passengers by seat belts and facilitate their exit after an accident? WHY ‘THERE NO ONE THOUGHT? 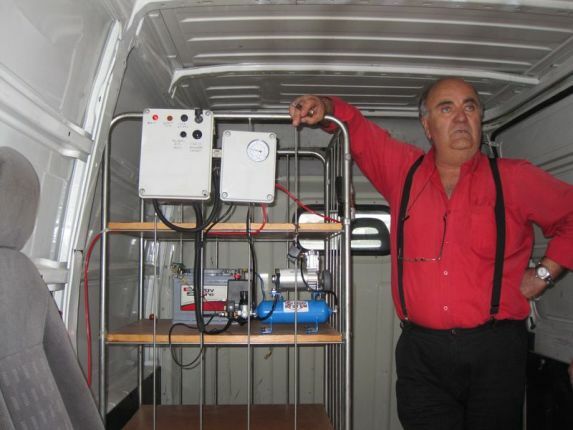 The invention made by Mr Sistino Malandrucco ( holder of an Italian company -Aurelia Autocarri- specialized in the transformation of trucks and cars) uses a pneumatic circuit controlled by an electronic control unit which, in the event of airbag deployment, it releases the seat belts and so it helps victims of an accident to get out as quickly or facilitates the work of the rescuers. The system hides a great potential for innovation in the automotive and marine markets and is one of those creations for which one wonders: why has not still thought anyone? The answer is that very often the thrust that pushes an inventor to create and implement a physical solution is only after colliding body and soul against a problem that no one has yet faced. And so it happened also for the automatic belt release device. All it started some years ago when Mr Malandrucco was witness to a road accident: the occupants of a Simca, which was on fire after an accident with a police car, could not – presumably in shock – to break free from the seat belts, which at the time were not even mandatory on all vehicles. Realizing that the police were not able to provide immediate relief because their car was overturned during the collision, so Mr Malandrucco ran to help the unfortunate. Having worn the uniform of the police knew where to find the fire extinguisher in the car of the police and so, thanks to adrenaline in his body, was able to save everyone. From that day he has constantly sought a way to release the belts as a result of an accident, up to the patent application No. RM2014U000124 system made for this purpose. The Italian invention is designed to run whenever the impact of the car requires the deployment of the airbags. The signal produced by the airbag crash sensor is processed by the control unit of the automatic release system that preloads the system and starts a control procedure to prevent an unsafe release buckles. As long as the accelerometer detects motion of the vehicle and before the pneumatic circuit is ready, which it means that has reached the useful pressure to release buckles, does not intervene. The wait is used to protect the occupants in case there is a multiple collision during the incident. When the car is completely stopped, the system control unit opens a solenoid valve that actuates the pneumatic release on each seat belt. This means that after pressing the red button release, the system returns upwards to the rest position using a second solenoid valve, without requiring special intervention outside of the normal maintenance. The innovative system was developed to provide a stand-alone operation of the pneumatic circuit, powered by a compressor and an auxiliary battery 12V and 2A, even in total black out of the vehicle. To make your vehicle visible even at night and in case of damage to the front and rear projectors, the backup battery operates the flashing mode or static auxiliary LED lights installed on the car. To avoid the risk of electric shock and fire, also, the car battery is disconnected from the power supply automatically when an air bag deployment through the control system of releasing belts.